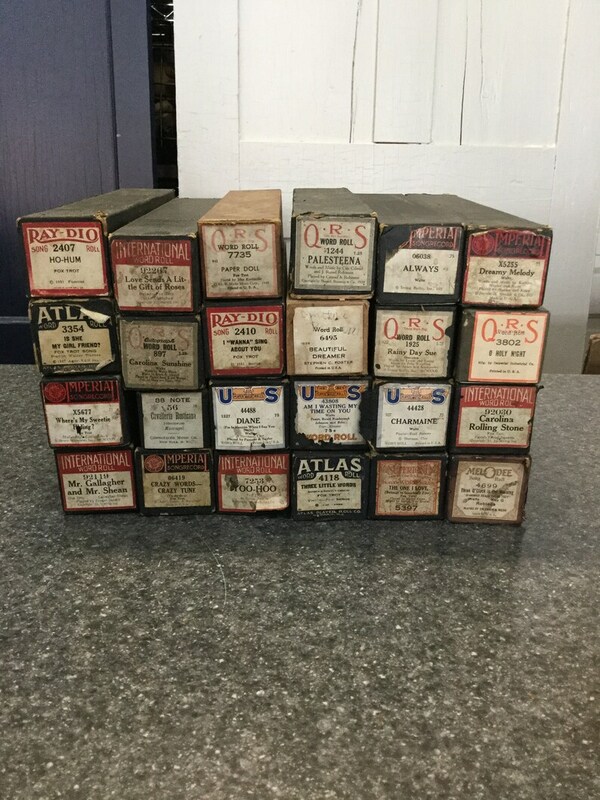 Vintage player piano rolls. We currently have 15 to choose from! Piano rolls were made continuously from 1898-2008. They are sold/priced separately. * Imperial Song Record 06419. Crazy Words-Crazy Tune. Fox Trot. * International Word Roll 7253. Yoo-Hoo. Fox Trot. Sylva-Jolson. * Q.R.S. Autograph Word Roll 897. Carolina Sunshine. Waltz. Words by Walter Hirsch. Music by Erwin R. Schmidt. Played by Harold Scott & Jeff Watters. * R.S. word Roll 1244. Palesteena. Words and music by Con Conrad & J. Russel Robinson. Played by Conrad and Robinson. * Imperial Song Record X5255. Dreamy Melody. Waltz. Words and music by Koehler, Magine, and Naset. Played by Stanley and Alden. * Q.R.S. Word Roll 7735. Paper Doll. Fox Trot. Played by Max Kortlander. * Atlas Word Roll 4118. Three Little Words ( Check a Double Check). Fox Trot. * US The Best Player Music Roll 43808. Am I Wasting My Time on You. Waltz. Pianist Harold Wansborough Johnson & Bibo. * International Word Roll 92030. Carolina Rolling Stone. Fox Trot. * Imperial Song Record X5677. Where's My Sweetie Hiding?. Fox Trot. * 88 Note 56. Cavalleria Rusticana. Intermezzo. Mascagm. * US Player Music Roll 44488. Diane (I'm in Heaven When I See You Smile). Waltz. Parsons & Taylor. * Word Roll 6495. Beautiful Dreamer. * Q.R.S. Word Roll 1925. Rainy Day Sue. One-Step. Words by Peter Wendling. Played by Arden & Kortlander. * Q.R.S. Word Roll 3802. O Holy Night. Vintage Philharmonic tuning forks pitch C.